Busy week finally over. Time for a breather. Listening to the Now Show, enjoying a wee dram of Islay Single malt (a Laphroaig Quarter Cask) while preparing this week's Friday Islay picture. 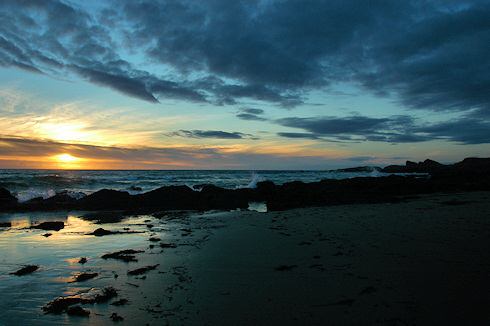 Decided to go for another beautiful Islay sunset at Saligo Bay. Why? Because I felt like it. As usual I will post the larger version (larger as in more than twice as big) on the Islay Pictures photoblog tomorrow. It will give you an even better view of the beach, the familiar sight of the ‘opera house rocks’ at Dun Bheolain to the north of Saligo Bay and obviously the sunset. Good night then, more Islay blogging tomorrow.